Was there a Link Between the FBI and the HUAC? “Hoover proclaimed his political support for the Committee on Un-American Activities and its members in the war on communism. They were no a team.”—Tim Weiner, Enemies, 149. Here is a picture taken during an HUAC hearing in 1948. The question of how linked the relationship was between the FBI and the House Un-American Activities Committee (HUAC) is to me one of the most interesting questions that can be asked of this period. By law they were two very different organizations falling under two very different departments. The HUAC was a congressional committee tasked with investigating and trying Americans who were allegedly guilty of subversive activities and allegiances. The organization was founded in the late 1930s and during its almost forty years of existence issued thousands of subpoenas and sentenced hundreds to jail for contempt of court (for refusing to answer the infamous question “Are you now or have you ever been a member of the Communist Party?”) The FBI on the other hand was a crime fighting institution that fell under the jurisdiction of the Department of Justice rather than Congress. The question remains, how closely were these two organizations linked in their shared objectives? As mentioned in a previous post, it was not uncommon for someone seated before the HUAC to find the committee members armed with the defendant’s entire FBI file. This was the heart of the link between these organizations. 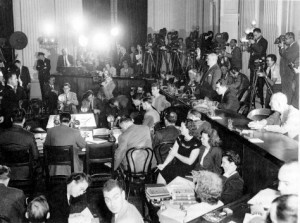 The FBI could go about their covert techniques of gathering information, but could now channel it to the HUAC for use as anonymously provided evidence against the defendant. Tim Weiner writes. “The FBI would gather evidence in secret, working toward the “unrelenting prosecution” of subversives. The committee would make its greatest contribution through publicity—what Hoover called ‘the public disclosure of the forces that threaten America.’” This link would remain mostly secret from the public for many years. Senator Joseph McCarthy of Wisconsin led the HUAC during the first few years of the 1950s. memoir, “During the Eisenhower years the FBI kept Joe McCarthy in business. 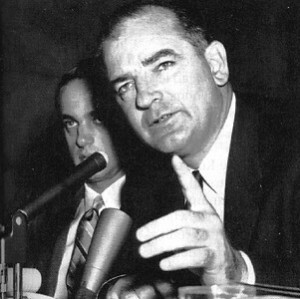 Senator McCarthy Stated publicly that there were Communists working for the State Department. We gave McCarthy all we had, but all we had were fragments, nothing could prove his accusations. For a while, though, the accusations were enough to keep McCarthy in the headlines.” This quote, if Sullivan’s book is indeed accurate, changes the picture a little bit. Rather than two titan organizations teaming up in order to fight communism in America, we get the image of the commonly used analogy of FBI as the puppet master. Rather than being a productive organization on its own, Sullivan’s account makes it seem as if the HUAC was nothing more but an assassin of public opinion ready to attack and besmirch the public image of anyone the FBI had dirt on. Despite the fact that J. Edgar Hoover was obsessed with the public’s opinion of the Bureau, it is clear that he preferred to leave the dirty work of public accusations to people who did not mind getting their hands dirty. Luckily, the HUAC was desperate for information and more than willing to provide that service. Tim Weiner, Enemies. New York: Random House, 2012. Pp. 149-150. William Sullivan, The Bureau. New York: W.W. Norton and Company, 1979. Pp. 45. This entry was posted in HUAC and tagged HUAC, Informants, J. Edgar Hoover, Joseph McCarthy by mattg. Bookmark the permalink. Joseph McCarty was never a member of the House Un-American Activities Committee as he was a Senator. He was on the Government Operations Committee. Otherwise helpful article. Did HUAC attack musicians too? My mother, who is now deceased, told me that my grandmother had become a member of the communist party well before I was born. She was a jazz musician and actually had a “trio” band that played in nightclubs. My Mom told me that during this time that the FBI had come to our home and scared the wits out of the whole family. I know that musicians like “Woody Guthry” who wrote about the struggles of the common man were harassed because of their political views. Would a jazz musician, like my grandmother, have been harassed because of her membership in the CPA?